Whoops! However, the game is pretty stable right now, and we’re making good progress towards Early Access release. We really appreciated all the community’s support inviting friends and streamers to come try the game. We had distributed over 4,000 codes for the Alpha by 23 December, and on the final weekend we had over 730 unique players log in. There were over 4,200 PvP casualties and you also managed to wipe out over 54,000 Humanoids! And it’s not stopped there – since the last Alpha weekend, we so far have over 1,400 new registrations to join the Alpha. 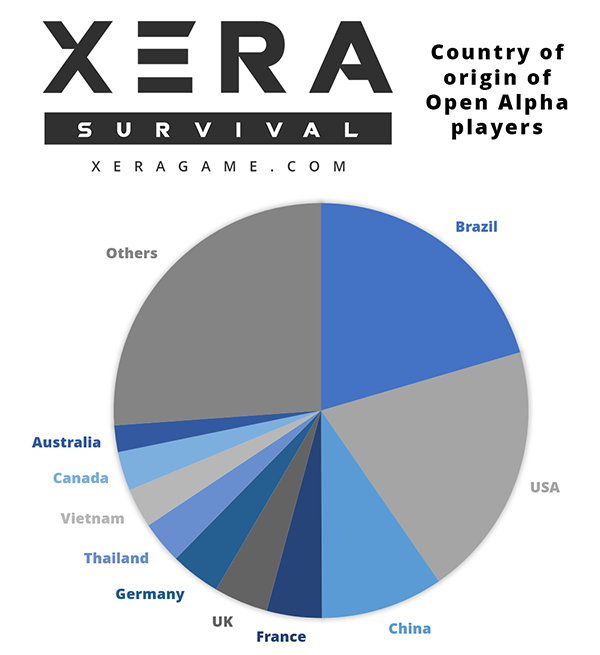 Along with our existing loyal XERA: Survival family who have pre-ordered the game, the community is growing rapidly! So welcome to all our new players – from 89 different countries. XERA: Survival has come a long way since the very first testing in June 2018 – sometimes we stumble across footage from back then, and we’re really happy with the steady improvement over the last 6 months. But there is still a long way to go. As well as regular updates through the Alpha, Joshua and the team are continuing to work through the roadmap adding features and content as they become ready. Much as we wanted to restart the Alpha weekends straight away, we needed a little time to focus on getting a bit more content ready for the game – as the weekends themselves tend to put us more in ‘maintenance mode’ than ‘development mode’. At present, we’re planning to run another weekend on 25 – 27 January and then again after two weeks (8 – 10 Feb). These dates are subject to change! If all continues to go well, then we are on course for moving into Early Access in the first half of this year, but again, it’s ready when it’s ready. What are the challenges we face? Making sure we have a good number of players coming back to participate in the weekend sessions, first and foremost. Not only do we want to attract new players, but we also want to make sure you all keep coming back for more. With the weekends running every two weeks, this should give Joshua and the artists time to add more between sessions. We expect there to be a new patch before each Alpha weekend moving forward. We’ve opened applications for our Creator Program, so if you are a streamer or if you know one who might like the game - have them apply here or invite them to sign-up for the alpha. Finally, a gigantic thanks to all our community helpers who step in at a moment’s notice to assist other players - you are all magnificent! For the record, Iced Yoshi (IcedYoshi#7281 on Discord) is now promoted to be overall Community Manager. He has always been the cornerstone of our community moderation and we look forward to working with him through 2019. Cheers!